Located in St. Louis, MO, the Eighth Circuit Court of Appeals hears federal cases that arise from the federal district courts of the Eastern District of Arkansas, the Western District of Arkansas, the Northern District of Iowa, the Southern District of Iowa, the District of Minnesota, the Eastern District of Missouri, the Western District of Missouri, the District of Nebraska, the District of North Dakota and the District of South Dakota. 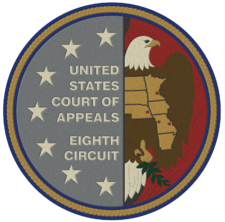 The Eighth Circuit has strict standards for the printing and filing of appellate briefs, and these standards differ from those of the other federal circuits. The starting point for a filling is, as always, the federal rules of Appellate Procedure. 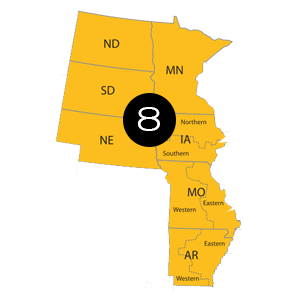 From there, the rules are modified by the local rules of the Eighth Circuit. Ten copies of each brief must be submitted along with one service copy to each party. Threecopies of each appendix volume must be submitted with one service copy to each party. Appellant shall prepare an addendum and file it with the opening brief. The addendum shall include: (i) a copy of the district court or administrative agency opinion or order including supporting memoranda or findings; (ii) any magistrate’s report and recommendation that preceded the district court opinion or order; (iii) short excerpts from the record, other than from the transcript of testimony, that would be helpful in reading the brief without immediate reference to the appendix; and (iv) other relevant rulings of the district court. The appellee’s brief may include an addendum not to exceed 15 pages. The addendum shall not exceed 15 pages excluding the district court or agency opinion and the magistrate’s report and recommendation. The addendum will normally be incorporated into the back of the brief, but may be bound separately if it includes a long district court opinion or report and recommendation. If bound separately, file the same number of addenda as briefs. After filing the notice of appeal, appellant must notify the clerk and all opposing parties in writing of the decision to prepare either a joint appendix or separate appendices. The appellee may file a separate appendix containing material not included in the appellant’s appendix. Appellee shall refer to record material found in appellant’s separate appendix rather than duplicating the material. If the parties conclude after the opening briefs have been filed that relevant material has been omitted from the joint appendix, they may agree to file a supplemental appendix. In the absence of agreement, either party may move this court to direct the clerk of the district court to transmit additional portions of the record.